A delicious and nutritious pantry staple! With a can of our versatile albacore in your cupboard you can always make a meal. Most fishermen we know use the same recipe we do when canning their own albacore: slightly thaw frozen-at-sea tuna so it can be loined by hand. Then chunk up the loins to the proper size and place in the cans with a bit of sea salt. Sometimes the simple ways are best. on 6/8/2010 Yum yum yum! 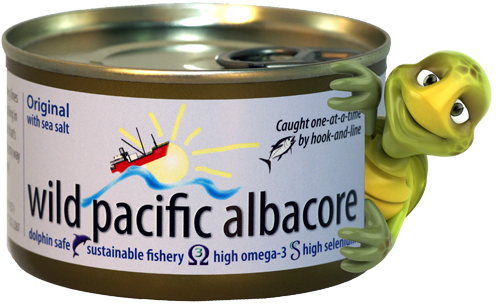 This albacore tuna is delicious! Best canned tuna I've ever tasted.